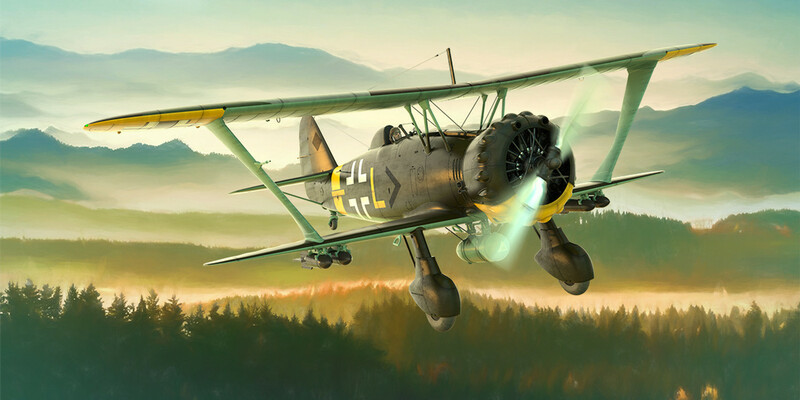 The Henschel 123 was an uncomplicated and robust aircraft. Very antique, no canopy, but excellent flying characteristics – unbreakable and very suitable for the poor airfields in Russia. It was very agile – we were able to sideslip the modern Russian fighters with this aircraft when we paid attention. If it was able to drive across the field in a truck loaded with 50 various items and the whole cargo was not toο noisy, this meant that the field was good enough for take-offs and landings of our Hs123 (which doesn't need more then 200m of runway). The Russians had broken through our frontline and were rolling forward with tanks. We were just four Hs123 and I succeeded in taking out three tanks by dropping my bombs on their rear decks, where they did not have enough protection. The fourth bomb fell wide and missed. At that point, I still had my machine guns loaded. I saw a company of Russina infantry – so I attacked.